The Army of Islam and the ISIS PR White Helmets, that POTUS Trump is about to provide air cover for in Syria, have been caught staging corpses of dead children in Douma. A BBC journalist expressed skepticism about an alleged chemical attack in Syria that the Trump White House has, without evidence, blamed on Bashar Assad. The BBC journalist tweeted that he was tired of “staged” scenes before deleting the post. The same Syrian rebels who claimed the Assad Government dropped chemical bombs on innocents in Douma were caught using dead children to play on Western emotions. Dalati later deleted his tweet! 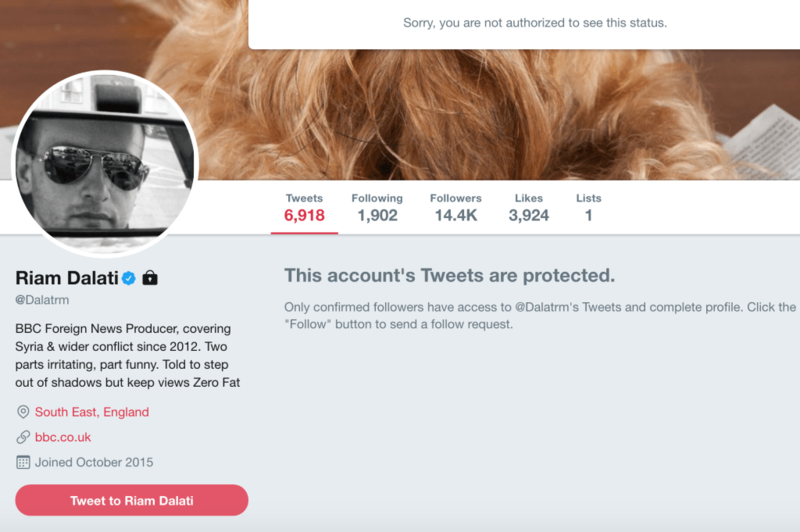 Not only did Dalati later delete the tweet exposing how the White Helmets staged the video being used to draw America into a Syria quagmire, but he went on to protect his twitter account from outsiders. Panorama travels with British doctors inside Syria to exclusively reveal the devastating impact of the war on children caught in the conflict. The doctors witness the aftermath of the bombing of a school by a suspected napalm-like incendiary device and medical facilities constantly under attack – both war crimes under international law. Filmed in the north of the country after the chemical weapons attack in Damascus which inflamed world opinion and brought America, Russia and the UN to the table, the film shows how the conventional war is intensifying with children bearing the brunt of this humanitarian catastrophe. 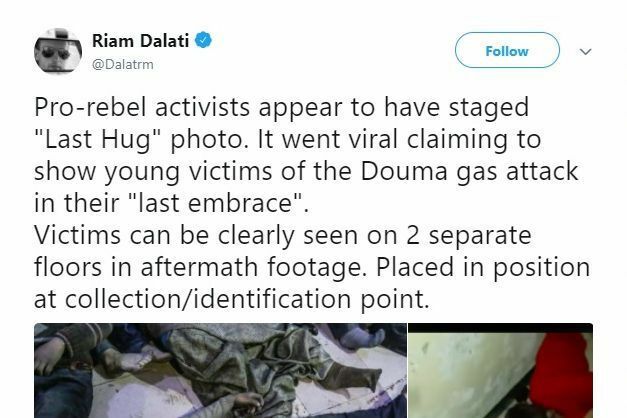 “Not so… original tweet correctly deemed in breach of editorial policy thru (sic) use of ‘sick/tired’” and by not providing context for a picture of a deceased Syrian girl who appeared to be giving a ‘last hug’ to another child who appeared to have died. Not so & thank u 4 asking me. Original tweet correctly deemed in breach of editorial policy thru use of ‘sick/tired’ & failure in providing ‘Last Hug’ photo with > context.